Machine learning has the potential to solve many of our regular human problems, like for instance having too few nightmarish, oddly cat-filled crude images to gaze upon. Luckily, Christopher Hesse created the edges2cats web-based tool to address exactly that issue. 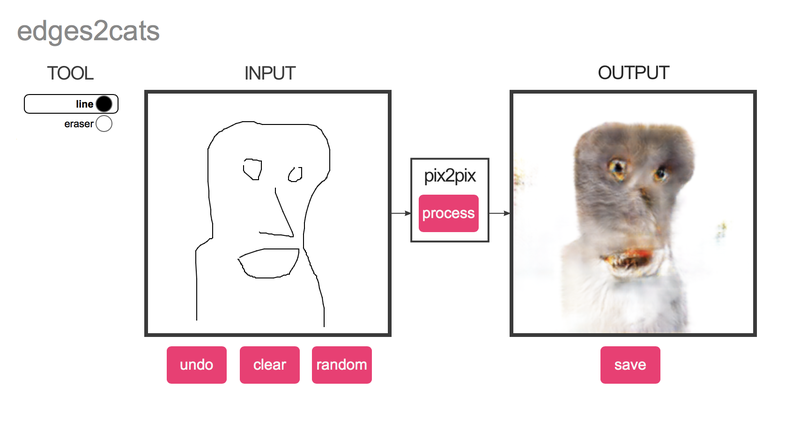 The machine learning software uses Google’s Tensorflow to translate one image to another, using training data provided by a database of over 2,000 stock images of cats to identify edges and fill in simple line art with what it estimates would be the best approximation of a realistic cat coloring of what it wrongly assumes, because of the limitations set upon it by its cruel creator, must be a cat. Hesse himself understates the impact of this significantly, writing that “some of the pictures look especially creepy,” and he theorizes that’s because we have a very good idea of what animal faces especially should look like, anything that features eyes in particular (like my own example above, with the source material provided unwittingly by my colleague) turns out especially horrifying. l previously covered a similar project that resulted in relatively successful coloring for supplied line art, and Hesse’s edges2 series includes variants that can color in shoes, handbags and building facades with much less unnerving results. We’re probably only at the outer edge of the many-layered onion of fresh horrors made possible by machine learning and AI, and previously unimagined by our feeble fleshy brains, so strap in. And please try to make your own abominations with this one, naturally.